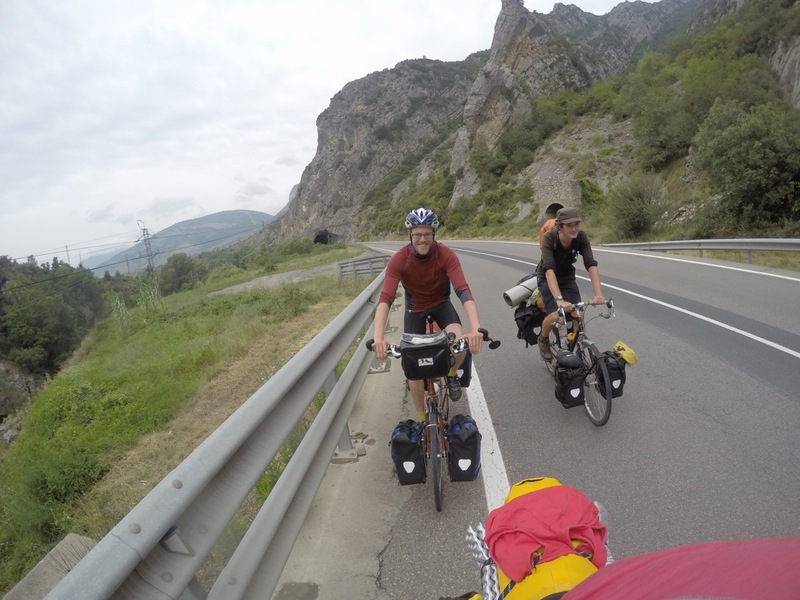 Lazy ride to La Seu – for people. for nature. After chatting to Joe we went to bed pretty late last night. We decided that today we would just do a short ride, which would give us time to catch up on everything we’ve ben neglecting the last few days. 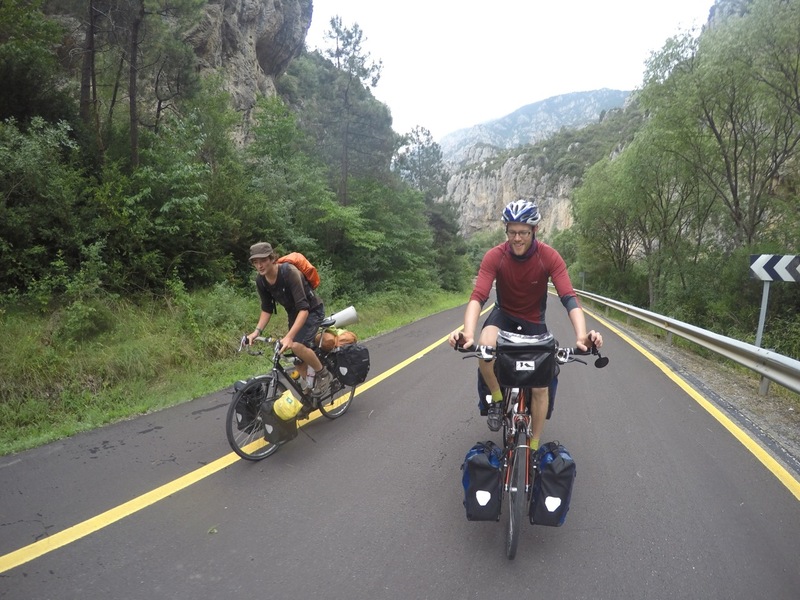 We were ready to go about 11 in the morning, and as Joe was going the same way as us as far as La Seu we decided to ride together. It was a lovely cool morning, we had a tailwind and it was great riding with someone else to chat to! We headed along the busy main road from Organyà, We climbed gradually as we followed the river through a mixed landscape of fields and occasional gorges. Joe also favours riding in the middle o the road! Riding round another tunnel – no cars! When we got to Organyà we were hungry so went to find some food for lunch. We found ourselves in the middle of a tightly packed street market, not ideal for the bikes! We got some bread and went to sit by the cathedral. There was a medieval fair happening which gave us something to look at while we prepped first lunch. Just then it started to rain, and we had to leg it with sandwiches in mouths to shelter under a covered pavement. It was full of cafe tables and other people trying to stay dry, but we managed to find a spot where we could peacefully eat lunch and watch the world go by until the rain stopped. Anna and I decided we would stay in Organyà to catch up with stuff, so we told Joe we were off to find a hostel. He decided to come with us, and we were soon in the Hostelling International hostel wondering why on earth there was no kitchen. It’s still a mystery. I kind of thought that was the pint of hostels! Argh I just remembered, the showers were also awful – you had to press a button which gave you literally two seconds of water. If you wanted something approximating a continuous stream you had to just stand there pressing and releasing the button with one hand while attempting to wash with the other. Terrible hostel. Anna and Joe did a quick shopping trip while I sat around reading about people who live with no money. It was really interesting – it sounds like its definitely possible, but you have to have a very different mentality and basically no fixed timescales for anything. Not sure I’m ready for that yet! Despite having no kitchen Anna made a delicious dinner of stew and pasta (mmmm), and we sat about chatting with Joe and drinking some suspiciously cheap (but tasty) wine. It sounds like Joe has had an interesting trip. Leaving Sheffield in January and staying in a squat in Barcelona left him with some great stories (and a few flea bites!). He also told us a hilarious story about his younger brother soiling himself while trying to force out a fart on a family caravanning holiday. Apparently his mother wouldn’t let thin throw away the pants as they were a present from an aunt. Sounds like a harsh regime! We headed to bed feeling like we had had a nice relaxing day, but hadn’t really achieved the intended goal of catching up with all our admin. Ah well, maybe tomorrow!